One of our readers suggested a more fair vs. comparison article would have the Galaxy Tab A 9.7 up against the Z300 Series (ZenPad 10). We agree with that visitor, so we’re putting out a few Galaxy Tab A comparison articles. Thanks for the suggestion! The Galaxy Tab A series is the more budget friendly tablet line-up. The Galaxy Tab S series are the flagship, top end Samsung tablets. Considering the ZenPad 10 is not at the flagship level, the 9.7-inch Galaxy Tab A is going to be an interesting comparison. In our hearts, we can call the outright winner, but let’s look at the facts (specs) of the matters first. Let’s get right into processing power. The Galaxy Tab A is sporting a Qualcomm APQ 8016 quad-core processor running at 1.2GHz. The ZenPad 10 is running the Intel Atom x3-C3200 quad-core processor running at 1.2GHz. No clear winner on the processor comparison. RAM wise, the Galaxy Tab A 9.7 has 1.5GB, and the ZenPad 10 series either comes with 1GB or 2GB depending on country or version. The Z300CG (3G) has 1GB of RAM, whereas the Z300C can have 1 or 2GB RAM and the Z300CL (4G LTE) comes with 2GB. Thus, it’s pretty much a tie regarding RAM. Storage wise the Galaxy Tab A 9.7 comes with 16GB and a microSD slot for up to 128GB cards. The ZenPad 10 comes with 8GB/16GB/32GB or 64GB (only Z300CL) storage options. The ZenPad 10 has a microSD slot, but it lists maximum card size at up to 64GB. Thus, do we call this a draw or give the edge to the Tab A 9.7 which can get you more storage for less via the microSD? Frankly we’re a bit confused about the max capacity of microSD card slots. However, on the basis of what we read, the cheaper storage will be on the Galaxy Tab A. However, you still need to look at the price difference between the two tablets, then look at the cost of storage and see where that ends up. If you pay more money to buy the Galaxy Tab A in the first place, we don’t think the storage will end up being the cheaper of the two. Display is a big part of a tablet experience (obviously) and is really key in deciding which tablet will provide a better experience. The ZenPad 10 (Z300 Series) looks to have the edge over the Galaxy Tab A in this comparison. The ZenPad 10 is not incredible with a 1280 x 800 resolution, but it’s much better than the 1024 x 768 resolution of the Tab A 9.7 tablet. We need a side-by-side comparison so a truly final verdict must wait. Yes, the ZenPad 10 is 10.1-inch and the Tab A 9.7 is 9.7-inch screen size, but the clearer, more crisp display likely will be on the ZenPad 10. Also keep in mind that the ZenPad 10 sports a 16:10 ratio whereas the Galaxy Tab A 9.7 has a 4:3 ratio. Another key in any vs. comparison is with size and weight. This should be interesting. 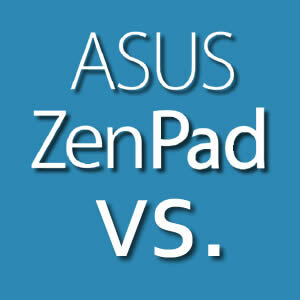 Weight wise, the ZenPad 10 goes from 500g or 510g depending on which of the 3 models you look at. The Samsung Galaxy Tab A 9.7 weighs 449g. However, this number needs to be calculated on a grams per inch basis. So when we adjust the weights, this is what we get: 46 grams/inch with Galaxy Tab A, and we get 50 grams/inch (using an average weight) for the ZenPad 10. An ever so slight edge to Samsung for weight. Size wise, thin is where it’s at. The other dimensions are not that relevant because the screen size differences between the two. So the Tab A 9.7 is 7.4mm thick, whereas the ZenPad 10 is 7.99mm thick. Not a draw or tie, but certainly very very close. Win goes to the Galaxy Tab A 9.7 for the size and weight comparison. Camera comparison, these tablets are very comparible. The Z300CG (3G) model has lesser camera specs, however this may be a typo on the official spec listings. The other ZenPad 10 models all show a 5MP rear, which is the same as the Tab A 9.7 tablet. The front camera is 2MP on the Tab A, and is matched on the ZenPad 10 under most variants. We can’t pick a winner at this stage, but only real life photo comparisons will establish the true victor. Speakers comparison is simply no contest. This is a very big feature and can really affect your enjoyment of a tablet. The ZenPad 10 has dual front facing speakers with DTS HD Premium sound. The Galaxy Tab A 9.7 really only has listed a speaker and it’s located on the side of the tablet. So front facing vs. side facing? No contest. One speaker vs. two? No contest. If we’re going to look at “value added” features that one tablet has over the other, this is where the ZenPad 10 really leaves the Galaxy Tab A 9.7 in the dust. First, the ZenPad 10 has the optional keyboard dock. For sure though a person can buy a keyboard case for the Tab A 9.7, but it’s not quite the same. Secondly, the ZenPad 10 supports the Z Stylus pen accessory. Pen input means there are many more uses for your tablet which is a real value add. Thirdly, the ZenPad 10 has 3G and 4G LTE models available depending on country. Battery life, we would expect the Galaxy Tab A to whip the ZenPad 10. Lower screen resolution and bigger battery all points towards an easy win in this comparison. The ZenPad 10 has a 18Wh battery and the Tab A 9.7 has a 6000 mAh battery. Thank you very much for the comparison, it will be extremely useful. Why no actual speed comparisons. Loading games,movies,etc. Number of apps running in background. In the US, this Samsung currently sells for $269.99, while this Asus sells for $159.00 with 2GB of RAM. The Asus seem like a real deal in comparison. Alternatively, the Samsung Tab E Nook 9.6″ is available at Barnes and Noble for $249 and it has a 1280×800 screen and bigger battery. Plus, they currently offer $25 to $100 in trade in credit.